This day is the holidapocalypse for geek celebrations—pick one, or get creative with the costuming and go for all four; personally, we think that a towel-toting Jedi with a lilac corsage and duct-taped glasses would sweep any costume contest held today. Don’t forget your towel, and don’t panic! Towel Day celebrates the work of author Douglas Adams, who wrote the Hitchhiker’s Guide to the Galaxy series. Feel free to celebrate any way you want, you zarkin’ frood—read a book, show off your “42” tattoo or lay down in front of a demolition if you’re feeling very brave and somewhat stupid. This is also Geek Pride Day, a chance to wear your dice bag out in the open or argue over the virtues of Apple vs. Linux. Of course, this is Star Wars Day, the annual celebration of the first movie’s release date in 1977, which was really the fourth movie and the official first movie was released fourth. Confused you are? It all makes sense in a galaxy far, far away. Finally, May 25 marks a tongue-in-cheek serious note ( like there’s any other kind with Discworld fans.) This is Wear the Lilac Day, which mixes a fictional holiday with a real cause in true nerd style. Originally written into the Discworld mythos by Pratchett as a day to remember those lost in the Glorious Revolution of Treacle Mine Road, it’s now also a day for fans to raise awareness and money for Alzheimer’s Disease, which Pratchett now suffers from. Any holiday that makes me choose between Adams and Pratchett is a tough one, but my lilac towel and Pan-Galactic Gargle Blaster (yea for TeeFury!) t-shirt await. How will you celebrate today? It’s a short sentence, but a powerful one for a writer to hear. I thanked the person and floated back to the truck. I have been lucky enough in my freelance career to receive many such compliments, and they always seen to arrive just when I need them most. Sometimes it will be a face-to-face meeting with a reader of my column, other times it will be an e-mail or card from someone who appreciated an article I’ve done. Within the last few years, I’ve started paying it forward by e-mailing, tweeting or leaving a Facebook comment for an author whose work I’ve truly enjoyed. Those comments are usually received enthusiastically, since under those rejection-hardened thick skins are often delicate egos needing a boost. Knowing that you’ve touched someone in a positive way with only your words makes all those nights and days hunched over a keyboard worth it, and kind, sincere words are something every writer needs to hear now and again. At least it all evens out. What was the most memorable compliment you’ve received for your writing? Share below! Today’s AW First Friday review is a poetry book…right after the end of National Poetry Month. What can I say? I’m a rebel, and there should be poetry in every month. There’s a lot to love about Love Is Like A Rainbow by Dawn Colclasure. Every poem is a love letter with a different address: some to a lover, some to a friend, others to a greater power above, and a few to the reader's own heart. Each paints a vivid picture, and I even choked up reading a few, something I don't do often. Colclasure is a master of structured verse, and her giving heart shows through in each and every page, from surviving the pain of heartbreak to rejoicing in passion. That said, my favorite poem is an unrhymed free verse called “Holding You.” It's sensual and intimate without being naughty. I approach poetry like jazz, free form with twists and turns, so it makes sense that this one would appeal to me. I hope Colclasure steps out more with free form and takes a few risks, because her riffs would be fabulous. I also adore “Don’t Cry Now,” a soothing lullaby of the heart. I can visualize these words passing between friends as one comforts another after all seems lost. 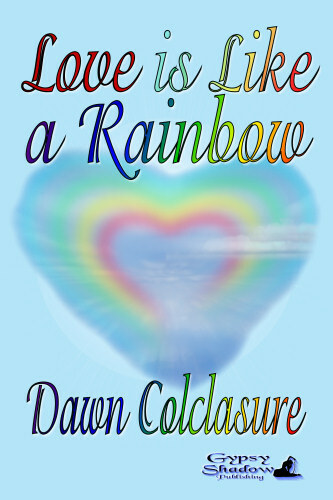 LOVE IS LIKE A RAINBOW would make a great gift for a sentimental significant other; in fact, there are many poems in this slim volume that would be perfect for a wedding or vow renewal. You can even buy it for yourself and re-live all your own bittersweet memories of the heart. It's available from GypsyShadow Publishing in ebook or print form.